Concussion! At what point does the referee take responsibility? I was recently lining on a senior game – so we had the full complement of bench personnel, including physios – where a home player was caught in a challenge between his goalkeeper and an attacking forward. He took a strong blow to the head and required almost four minutes of treatment before he could be helped from the field. His team had already used their full set of substitutes, so played with ten men for about 10 minutes, after which time his coach announced that the player was ready to return. I was on the far side of the pitch from the benches, so it was difficult to know exactly what was happening but there was clearly some disagreement with the away manager and the referee needed to attend in order to sort it out. The player lasted only a few minutes before suffering a complete collapse and a further lengthy stoppage culminated in the player being carried from the field on a stretcher and an ambulance having to be called (we later heard that the player was allowed home from hospital later that evening). The referee received a further haranguing from the away manager during this stoppage and it was clear that his issue had been that he had not considered it safe for the player to have returned. It later transpired that the home physio had not been happy with the player’s returning to the game but had been overruled by the home coach. I was unable to determine, in later conversation, whether the referee had been made aware of the physio’s reluctance before the player came back onto the pitch (the conversation was very one-sided and mainly consisted of the referee insisting that he did not have the necessary medical qualification to overrule the coach’s decision). It’s a difficult one and certainly easier to consider in hindsight but, should I find myself reffing in a similar position (or indeed assisting on the bench side), I will make it my job to seek out the physio and assure myself that he/she is convinced of the player’s fitness to return. Should I be reffing at a level where no such medical opinion is available (i.e. a parks game), then I will not be allowing a player who has received a clearly serious head injury to return to the game, regardless of what that player, or his manager, has to say about it. 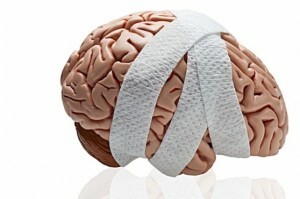 In the meantime, have a look at this short article from the FA launching their concussion guidelines, ‘Check the Net’. *The FA’s Concussion Guidelines, published in 2015, can be accessed here.